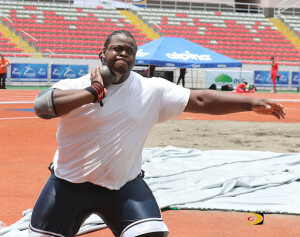 Eldred Henry used a season’s best to win the Mesa Classic Discus Throw Open Division in Arizona over the weekend. Competing unattached, Henry had a winning throw of 55.35m, then was third in the invitational Shot Put with a 17.75m effort. At the same competition, Central Arizona sophomore Tynelle Gumbs, followed up her recent 56.13m effort in the Hammer Throw, with 54.45m heave to place 11th overall in the invitational division. Her series included all throws 50.18m or better. She was ninth in the Open Discus Throw with a 42.48m mark, which came on her final attempt. At the Johnson C. Smith Invitational, St. Augustine Jr. Khari Herbert was fourth in the 400m in 47.69 seconds. Coming off an injury that affected his performance in the final of the NCAA Division II Championships 400m, he opened his outdoor campaign with 47.15 at the Florida Relays last weekend. Tahesia Harrigan-Scott, competing in the Miami Alumni Classic on Saturday, opened the outdoor season with a fifth place finish in the 200m. She was timed in 23.77 seconds. Following a break in action, the BVI Athletics Association Development Series resumes on Friday at the A. O. Shirley Grounds, targeting U9, U11, U13, U15 and Open Division athletes. Competition opens with the Javelin Throw for male and female, followed by the Long Jump targeting U11 through the Open Division. Running events will begin at 6:30 p.m. with the top eight fastest times advancing to the the finals beginning at 7:30 p.m. Events include the 60m for U9 Boys and Girls; U11 Boys and Girls 80m dash followed by the U13, U15 and Open 200m dash. The 60m final is slated for 7:30; the 80m at 7:40 and the 200m at 7:50. A second meet is scheduled for April 22. Events on the program will include: 100m U13 through Open. Open 400m; 150m for U9 and U11. Shot Put, U15 to Open; Triple Jump, Open and High Jump, U13 to Open. Five of the territory’s 2018 Youth Olympic Games hopefuls, will compete in French St. Martin on Saturday and in Anguilla on Sunday. The athletes and their respective events are: Tashara Edwards, 200m; Naya Penn, 100/200m; Zara Brown, 100/200m. Xiomara Malone, Long Jump and High Jump and Z’Niah Hutchinson, Long Jump and High Jump.